Renowned for our strong academics and balanced and holistic approach to boys’ education, we recognise that boys think and learn differently from girls. Cutting-edge educational practices include Leadership Development, Emotional Intelligence, and Thinking Skills. We also provide integrated programs of co-curricular and academic, with a low student-to-staff ratio. Students also participate in an extensive leadership development program within the School. TSS offers a comprehensive academic program designed to prepare students for university and other tertiary studies. Whilst the School has a history dating back over 106 years, the progressive approach to boys’ education enables them to prepare for life after School. International students have been a welcome addition to the TSS community for over 50 years. There are approximately 1,600 students enrolled at TSS and over 300 of these are residential boarders. Whilst providing the advantages of a new English-speaking culture for international students, our local and country students are also able to interact and learn from a diversity of cultures. This arrangement provides an invaluable experience for both International and Australian students. This comprehensive handbook contains all information pertinent to our overseas students. Students must comply with the requirements of the Department of Immigration and Citizenship (DIAC) regarding regulations governing international student entry to Australia. They should also seek prior approval from DIAC before commencing a new course or changing courses. A copy of the student’s school reports for the last two years – certified copies translated into English. A reference from the student’s principal or class teacher at the time of registration. Copies of any certificates of public examinations (where applicable). Results of an Australian Education Assessment Services (AEAS) Test or produce evidence that his level of English is of sufficient standard to enable him to cope with mainstream classes. The required records as set out above must accompany a completed Application for Admission form and the AUD$200 Registration Fee. Having considered all records and any further information which may be requested, the Headmaster of the School will make the final decision on the acceptance of any overseas student into the School. Applications from overseas are processed according to established policy and procedures and are dealt with on their merits. If a place in the School is available we will post a Letter of Offer and request payment of the Enrolment Fee of AUD$2,800 and the first installment of Tuition and Boarding fees. (This will be an estimation of half of the total cost of Tuition and Boarding fees for the first year of study). See Schedule of Fees. An Enrolment Agreement Form will be enclosed. This must be signed and returned to the School with the fee payments. When the fees have been paid the School will use you a Confirmation of Enrolment Certificate. This should be taken to the Australian Embassy in order to apply for a Student Visa. Once the student visa is issued, a copy must be provided to the School. Before entry to the School you will be provided with both the Boarding and Admissions Booklets and any information regarding orientation, stationery and uniforms etc. Overseas students applying to the School must undertake studies on a full-time basis, be academically qualified for the proposed course, be proficient in English at the required level, and have the financial capacity to cover all expenses including return airfares and living costs, and they must be of good health. The School Rules, Social Code, Uniform and Discipline and Enrolment Agreement forms are all important documents and should be read carefully. The Enrolment Agreement form must be signed and returned to the School with your first fee payment. Students must abide by the terms and conditions specified in the Application for Admission and the Enrolment Agreement.Students are required to start on the first day of each term and finish on the last day of each term so they are enrolled and participating in School activities. An exception may only be made with specific permission of the Headmaster.Students shall attend all applicable lessons, classes, test and examinations during a course as well as submitting all assignments that are applicable to their chosen subjects. For purposes of safety and duty of care, The Southport School’s enrolment policy requires that visa students in Years 1 to 12 have one of their parents residing on the Gold Coast to supervise and be responsible for them. Visa students in Years 7 to 12 who do not have a parent residing on the Gold Coast live in the School’s Boarding House to ensure that students are safe and properly cared for, and to provide suitable conditions for study.For further information please refer to the following Overseas Student policies located on our Policies Page. The Southport School requires evidence of sufficient proficiency in English to successfully meet the curriculum demands. To best prepare a boy for a successful start at TSS we recommend that high school students attend one of the following ELICOS Centres and are generally expected to undertake 2 terms of High School Preparation course (HSP). 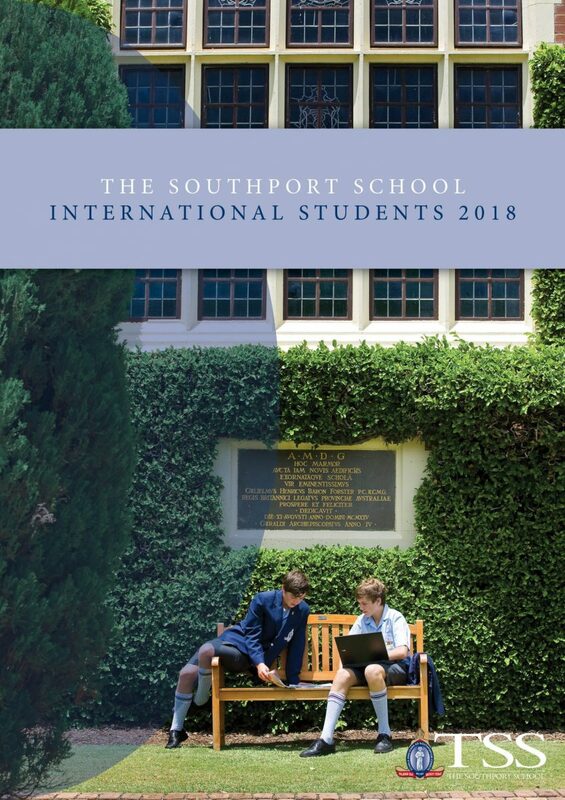 The Studies Department of The Southport School closely monitors the boys’ progress and advises the family of the best commencement date at TSS. During school holidays if the boy is not returning to their parents during the break, Homestay can be arranged through Australian Student Accommodation . Please refer to the below application form and policies.